The Korea Advanced Institute of Science and Technology showcased its academic excellence in front of foreign diplomats Friday in a bid to strengthen global partnerships. 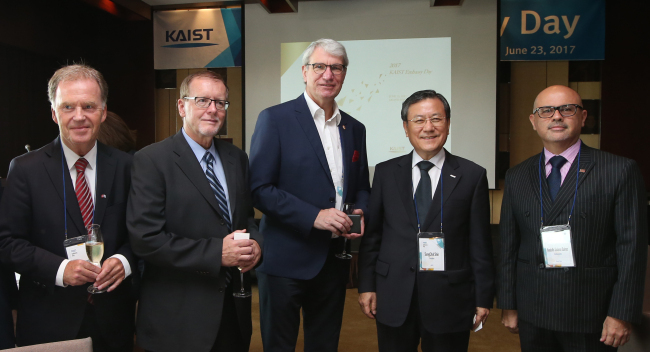 “KAIST is gearing up for another round of innovative initiatives in education, convergence research, technology commercialization, future strategies and globalization,” said KAIST President Shin Sung-chul. At the first Embassy Day at Grand Hyatt Seoul, the university presented some of its finest research, including the development of humanoid robot Hubo by professor Oh Jun-ho, director of the Humanoid Robot Research Center; metabolic engineering advances made by professor Lee Sang-yup, dean of the KAIST Institute; and strides made in combatting breast cancer and metastasis by professor David Helfman of the Department of Biological Science. There are some 180 foreign faculty members and researchers from over 31 countries at KAIST, representing nearly 9 percent of the total faculty, and 710 foreign students from 86 countries, making up 8 percent of the student population. “Most faculty members are from top institutions from the US, Europe and the world, and they have very resourceful contacts abroad with distinguished researchers and scholars,” said professor Jean-Charles Bazin of the Graduate School of Culture Technology. KAIST is a public research university located in Daedeok Innopolis, Daejeon, and was established in 1971 by the government as the nation’s first science and engineering research-oriented institution. Thomson Reuters ranked KAIST as No. 6 on its list of the most innovative universities in the world and as the most innovative university in Asia for 2016. KAIST has two campuses in Daejeon and one campus in Seoul. The Embassy Day event gathered some 100 diplomats from 65 countries, including German Ambassador Stephan Auer, Canadian Ambassador Eric Walsh, Australian Ambassador James Kim, Norwegian Ambassador Jan Grevstad, Austrian Ambassador Elisabeth Bertagnoli, Czech Ambassador Tomas Husak, Latvian Ambassador Peteris Vaivars and Costa Rican Ambassador Rodolfo Solano Quiros.